Shares of Crocs Inc. jumped $5.91, or 27.6 percent, to $27.35 on Thursday after the company reported earnings that flew past Wall Street’s targets on robust growth in the Americas region and meatier gross margins. Guidance was sharply lifted for the year. In the quarter, revenues rose 7.3 percent to $261.1 million, led by major gains in the Americas. Under its guidance, Crocs had expected revenues in the range of $240 to $250 million. The growth was achieved despite the loss of approximately $15 million due to operating fewer stores and business model changes. Currency-neutral growth accelerated to 9.3 percent from a 2.3 percent gain seen in the second quarter and 0.7 percent increase in the first quarter. Among channels, Wholesale sales added 9.3 percent to $116.7 million with especially strong performance in Asia Pacific and the Americas. By region, wholesale sales grew 7.8 percent to $44.9 million in the Americas, gained 12.8 percent to $40.9 million in Asia Pacific, and tacked on 2.8 percent to $29.4 million in Europe. E-commerce revenue grew 23.2 percent to $45.8 million due to increased traffic, higher units per transaction, and a higher average selling price (ASP) as consumers continued to migrate to online shopping channels, and the company continued to invest in digital marketing. Retail channel sales decreased 0.8 percent to $98.5 million as Crocs operated 85 fewer retail stores year-over year. During the quarter, Crocs opened three and closed 12 company-operated retail stores, to end the quarter with 389. Global comps grew 15.0 percent, attributable to higher ASP and units per transaction. Overall, higher ASP increased revenues by approximately $17.7 million, or 7.2 percent. Higher unit sales volume increased revenues by $4.8 million, or 2.0 percent. A decrease of $4.7 million, or 1.9 percent, resulted from unfavorable foreign currency translation. Crocs sold 13.3 million pairs of shoes worldwide in the quarter, an increase of 2.0 percent year over year. Net income improved to $6.5 million, or 7 cents per share, compared to a loss of $2.3 million, or 3 cents, in last year’s third quarter. Wall Street’s consensus estimate had been 2 cents. Gross margin was 53.3 percent, improving 250 basis points over last year’s third quarter, driven by favorable product mix. Gross margin was forecast to expand approximately 50 basis points. The margin performance was aided by stringent inventory controls Inventory declined 16.1 percent. SG&A expenses increased 3.6 percent to $125.2 million. Crocs indicated this was higher than guidance due to incentive compensation and other variable costs associated with higher revenues. Cost-control efforts still reduced SG&A as a percent of sales by 170 basis points to 47.9 percent. Non-recurring charges amounted $6.3 million in the latest quarter compared to $3.6 million in last year’s third quarter. Those charges consisted of $5.0 million to close the company’s manufacturing facilities and $1.3 million associated with the company’s SG&A reduction plan. Operating earnings improved four-fold to $13.9 million from $2.7 million. By region, Americas’ sales expanded 13.7 percent to $137.0 million. The increase in revenues was led by a 25.3 percent increase in e-commerce due to increased traffic and units per transaction. Retail increased by 13.7 percent, despite operating 10 fewer retail stores compared to the same period last year, due to comparable sales growth of 19.9 percent. Higher unit sales volume resulted in an increase of approximately $4.6 million, or 3.8 percent, with an increase in ASP generating $14.0 million, or 11.6 percent. Wholesale channel revenues in the Americas region increased 7.8 percent in response to greater customer demand in North America. The effect of foreign currency translation was a decrease of $2.1 million, or 1.7 percent, overall on the region. Operating profits in the Americas’ region jumped 74.5 percent to $42.6 million. Gross margin increased 670 basis points to 58.4 percent due to an increase in ASP. SG&A for the Americas segment decreased 1.5 percent due to a decrease in facilities expense of $0.9 million related to store closures, partially offset by net increases in marketing and other expenses of $0.3 million. In other regions, sales in Asia Pacific dipped 0.2 percent to $75.2 million while gaining 1.6 percent on a currency-neutral basis. E-commerce revenues increased 18.3 percent and wholesale revenues climbed 12.8 percent while Retail decreased 22.2 percent. Operating income gained 19.4 percent to $16.9 million. In Europe, sales inched up 0.4 percent to $47.4 million and grew 3.2 percent currency-neutral. E-commerce revenue grew 23.6 percent and wholesale added 2.8 percent, more than offsetting a decline of 16.8 percent in Retail results. Operating earnings more than doubled to $12.0 million from $4.9 million. For the fourth quarter, Crocs expects revenues of $195 to $205 million compared to $199.1 million in the fourth quarter of 2017, including a negative currency impact estimated at $5 million. Gross margin is projected to be approximately 80 to 100 basis points above last year’s 45.4 percent rate. SG&A is expected to be approximately $10 million below last year’s fourth quarter SG&A of $120.7 million, including non-recurring charges of $2 million in the current quarter compared to $9.4 million in the fourth quarter of 2017. SG&A to be approximately $495 million compared to last year’s $499.9 million and prior guidance calling for SG&A to be slightly higher than $485 million. This change reflects increased incentive compensation and other variable costs associated with higher revenues. Income from operations are now expected to be slightly under $60 million compared to $17.3 million in 2017 and the prior guidance of $50 million. 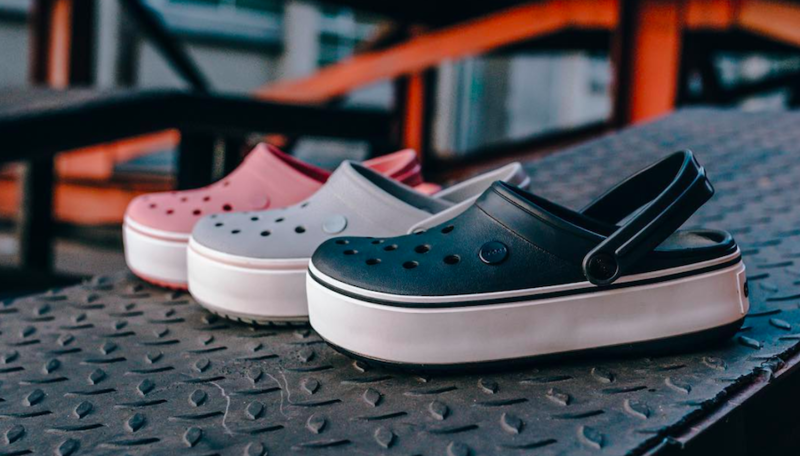 Crocs also provided initial guidance for 2019, including expecting a mid-single digit increase in revenues. E-commerce and wholesale growth are expected to more than offset lower retail revenues associated with the reduced store count, which is expected to reduce revenues by approximately $25 million. Adding back that $25 million reduction, 2019 revenues are expected to be up mid to high single digits over anticipated 2018 revenues.